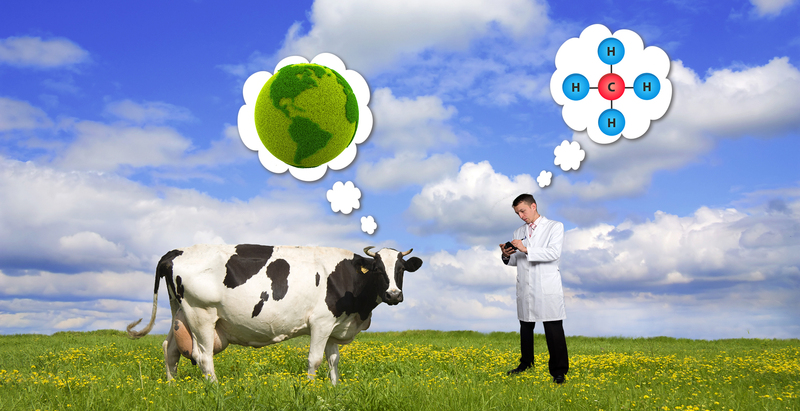 Scientists divided on whether methane-producing livestock can be planet friendly. It seems few animals are more loved and hated on film nowadays than the cow. Either it’s a boogie-man(imal) that helps drive climate change or an ungulate environmentalist able to store carbon in soil. Cows are vilified in Cowspiracy, a film on the climate change effects of eating meat, but embraced in Soil Carbon Cowboys, and the forthcoming Kale vs. Cow: The Case for Better Meat. “It’s not the Cow; it’s the How” goes a common defense. But for many it comes down to a moral choice: for the vegan, goodness comes from rejecting animal food; for the pasture manager, good food comes from good farm practices. Are the claims of these two positions backed by scientific data? This is the question we asked those who are researching the topic. The answer, we found, is not simple. But agreement among scientists ends when it comes to solving the problem. Vegans say individuals should embrace a diet free of meat and milk, thereby eliminating cows from agricultural systems altogether. Meanwhile, scientists who research pasture management consider cows and other animals part of the crop-livestock, mixed-farming systems that have fed humans for most of history. Through good pasture management carbon could be returned to the soil, the way it has been for centuries. Alan Savory is a major advocate for well-managed grazing as a solution to many environmental problems, including climate change. Recent soil science discoveries show that good grazing management creates soil rich in the microbes that remove excess carbon dioxide from the atmosphere. Savory goes further, arguing that the regeneration of world grasslands, through holistic regenerative livestock grazing, can also reduce poverty and desertification in grassland areas. However, most of the scientists we interviewed stated that Savory’s claims went too far or, as one put it, were “outrageous.” They argue that the real numbers do not support his claims. While evidence increasingly suggests regenerative systems are less harmful, it does not yet support the conclusion they are climate neutral or – as Savory claims – actually climate-friendly. Peter Byck is the producer of Soil Carbon Cowboys, a set of videos based on a kind of pasture management method called “adaptive multi-paddock” or “AMP” grazing. He is a Professor of Practice at Arizona State University, working with an interdisciplinary group of agricultural research scientists. Yet, when asked whether the data support how much carbon can be sequestered this way, he points out that “The science is really thin right now…there’s almost nothing out there on AMP grazing…there’s a lot more to learn.” Byck is no less excited about the success he sees in the field, however: “We see tremendous success at the rancher level.” The results go beyond carbon to other environmental benefits such as water quality: “Streams that had dried up were becoming perennial again.” But, he noted, “people are telling us this is anecdotal evidence” and that more hard data are needed. Vegan activists have been attacking Savory as an apologist for meat eating. And some of the scientists we interviewed agree that meat consumption remains the most important issue. For example, soil scientist Daniel Kane authored a report for the National Sustainable Agriculture Coalition on the potential for agricultural carbon sequestration. But even he noted that “Methane emissions are still a huge problem even if we use these soil programs.” Dr. Peter Smith, of the University of Aberdeen, sees pasture management as important, but that meat-eating should be the “top priority.” Dr. Timothy O’Riordan, of the University of East Anglia, was even more insistent, arguing for a focus on consumers’ “friction of response” against lowering meat. Dr. Gerald Nelson, of the University of Illinois, agreed, noting that lower meat consumption was better for human health as well. Other scientists see the issue more in terms of maintaining a balance between the need for better pasture management and the need to reduce meat consumption. “Any livestock system can and should be sustainable, provided that it balances environmental responsibility, social acceptability and economic viability,” stated Dr. Judith Capper of Washington State University. Dr. Nelson noted that some people were undernourished in terms of protein and that, in those contexts, the challenge is to produce meat in an environmentally sustainable way. Yet, even this balance argument has come under challenge. A recent report by the Oxford Food Climate Research Network examined several decades of research on pasture management. It concluded that the environmental impacts of grazing animals outweigh any regenerative benefits. Pasture management scientists counter that it is too soon to make final conclusions about the cow-climate balance: soil microbiome studies are starting to yield more information on the role of microbes in soil sequestration, which may lead to more positive results. Personally, I wish that advocacy groups on all sides would focus more on the science than emotions and rhetoric, as, unfortunately, some of the loudest ‘voices’ in the conversation often have less scientific information to impart but because of sheer numbers or volume, get the attention of retailers and policy-makers. Why is the relationship between livestock and climate change so complex? A major issue is something scientists refer to as “tractability.” How do you put numbers on how much carbon is admitted from a given farm on a given day? How do you balance that with the emissions of methane from a given animal? As Dr. Rattan Lal of Ohio State University explained to us, “site specific options have to be identified in relation to the local biophysical and socioeconomic factors.” Increasingly, new research is showing that results differ widely over these environmental contexts, making universal solutions even more difficult to implement. Because of these complexities, Dr. Mark Howden, of the Australian National University, argued that it might be better to focus on tractable targets: “the conjunction between the significance of the emissions and the ability to do something about it.” Dr. Howden mentioned transport and other carbon reduction targets, where getting the numbers is simpler. Finding solutions to these more tractable problems may be easier than taking on the complexities of contextual farm and farmer practices. On the other hand, some scientists argue that the numbers are already good enough to act upon. Why? Because action may lead to policies that will at least mitigate how livestock practices effect the environmental in general, particularly water resources. If it’s not possible to stop meat consumption, and these regenerative grazing practices have many clear, if less tractable, environmental benefits, why not create policies now that reward farmers for transforming their grassland management practices? Some states are moving in this direction and some scientists, working together with policymakers, have been willing support immediate policies based on conservative estimates as to what regenerative pasture management can do. At the forefront is California, where farmers, policymakers and scientists at The Marin Carbon Project are working to formulate regenerative agriculture plans with real numbers that quantify the carbon sequestered from particular farms. These numbers will be useful if farmers want to participate in various carbon reduction programs. While some scientists have been critical of advocates, the researchers at The Marin Carbon Project and UC Berkeley are working actively with those who advocate for inclusion of climate in the state’s agriculture policies, such as The Healthy Soils Initiative. New York is also considering legislation to encourage farmers to participate in regenerative agriculture projects as part of its climate change planning. “We still have many knowledge gaps relating to the impacts of various technologies and management practices on greenhouse gas emissions and resource use,” admitted Dr. Capper, who sees her role as helping to fill in those gaps. Advocating for action based on existing data are those who want immediate policy options that incentivize better farm stewardship. But no matter their position, all the scientists we interviewed agreed that solutions will not be simple and that more research will help move us toward better policy. E. Melanie Dupuis is professor and chairperson of the Department of Environmental Studies and Science in the Dyson College of Arts and Sciences at Pace. Nicole Virgona is a candidate in the Master of Arts in Environmental Policy program at Pace.